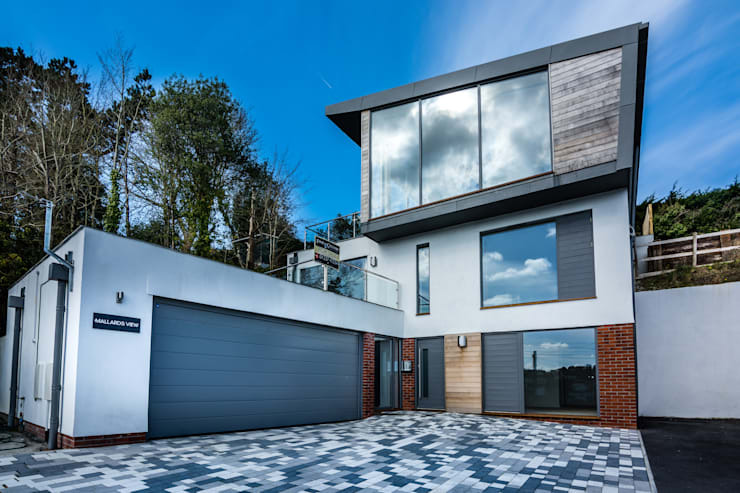 Today, we are going to explore a modern home designed by professionals Trewin Design Architects, which shows just how much of a role nature can play in the decor and design of a home – even a contemporary one! The surrounding views of this functional yet trendy home are integral to the architectural structure, resulting in a light, bright and warm environment both inside and out. We will also witness out natural materials can merge a rustic design with a modern home flawlessly. Nicknamed Mallard's View, from this angle we can see how the architecture is made up of different layers, shapes and volumes. The L-shape of the structure creates a gorgeous little alcove, keeping the entrance of the home sheltered and private. The double garage neatly packages the exterior look and feel while keeping cars and other vehicles stored neatly out of sight. The mix of wood, iron, white plastered walls, grey finishes and large glass windows and doors creates a very warm, earthy and appealing look and feel. From this side, we can see how the architects have worked with the landscape available to them, moulding the home into the steep topography. The home is made of three-storeys and has been designed in an open plan structure, creating a very spacious look and feel throughout. The star of the show, as we can see here, are the impressive views, however. 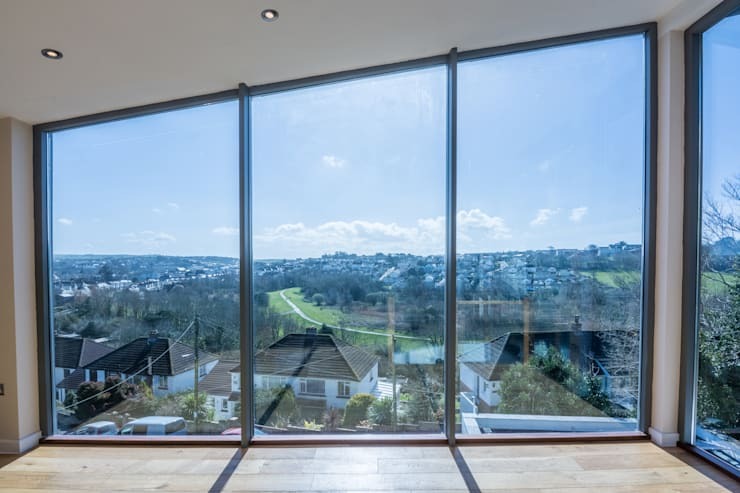 The home looks out onto gorgeous and panoramic surrounds! The entrance is the first impression that people will get of your home so you want it to be functional, warm and welcoming. This modern entrance features a simple yet elegant grey door, a large glass window and a spacious entrance hall with more than enough space for family and friends to greet one another. The large glass window allows sunshine to stream in while offering a simple transparent barrier between the interior and exterior spaces. 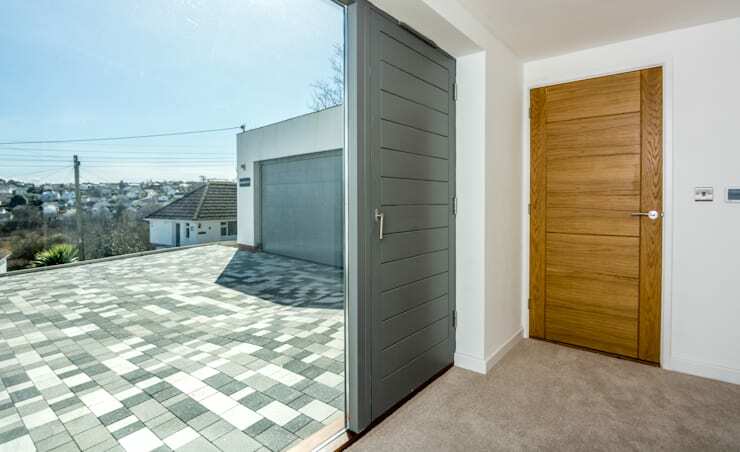 Don't you love the contrast between the grey, the glass and the wood as well as the mottled grey tiles that make up the driveway? Have a look at these 7 impressive ideas for your entrance for inspiration for your own home. If we head inside the home, we can see how the open plan design lends itself to quite a minimalist look and feel. Only the most functional of items are on display. The kitchen features white cupboards and drawers, wooden floors and white walls as well as dusty pink marble counter tops. 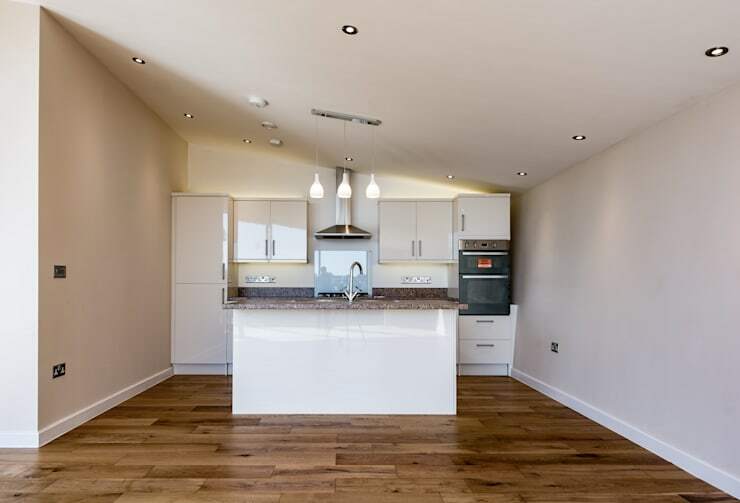 The kitchen island in the middle of the room subtly separates the cooking area from the rest of the home while providing an extra storage unit and surface area for cooking and preparing food. This is a wonderful example of how less can be more! The bathroom is often overlooked in design and decor but this should not be the case. As we can see in this image, a bathroom can be one of the most elegant and sophisticated rooms in the house. Considering how much time we spend in it, this is how it should be! The designers have gone for darker tones in this space including grey walls and charcoal black tiles, which work in harmony with the modern white features. Do you see how the designers have used the walls to bring a bit of texture into the space while maintaining the neutral colour palette? In this image, we can see how large glass windows and doors allow for the interiors and exteriors to merge into one another. 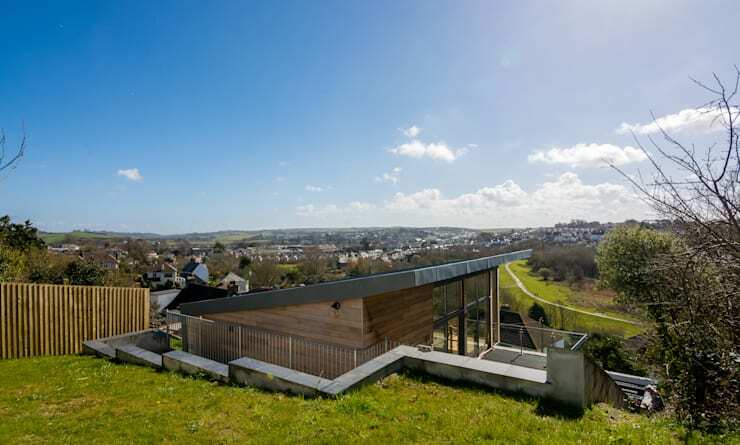 The home opens up onto a spacious terrace, which allows the family to really take advantage of the surrounding views. Do you notice how these large glass windows and doors make the living space seem that much bigger and more expansive? Finally we get a chance to see the gorgeous views from the top storey. The large glass windows allow for panoramic access! This is a wonderful example of how the landscape is framed by the windows, making for a natural form of artwork. What more could you need for the focal point? 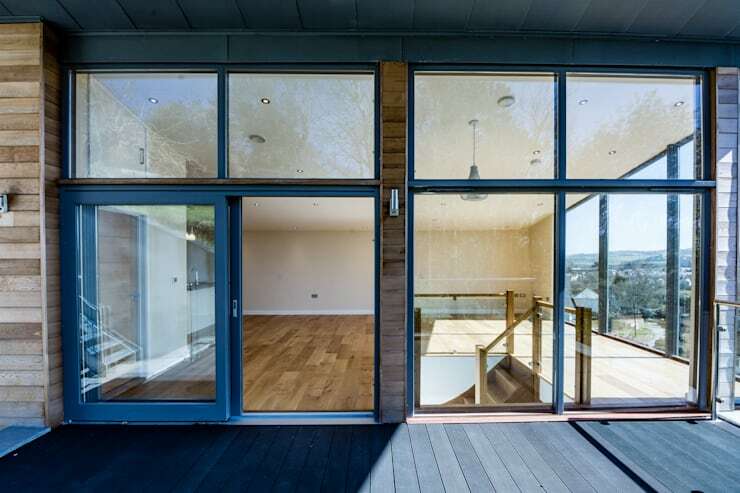 This also allows natural light to flow into the space, making for a very warm and refreshing interior. Looking for a house that capitalizes on the view?We got a Modern Dream Home with a Beautiful Perspective. Would you want to live in this home?